Through a practice that focuses on communication with physical/digital interaction to create large-scale experiences, Matthew Mohr looks for a quality of beauty and intensity of emotion in everyday moments normally considered inconsequential, magnifying them to reflect humanistic ideals. His visual language is heavily influenced by design in all forms and regard for simplicity. By inviting all to participate, Mohr asks through interaction with his art, to reconsider a common moment as an opportunity to explore several facets of it. “As We Are” presents Columbus as a welcoming, diverse culture where visitors and residents can engage on multiple levels through an interactive experience with public art. It is an open-ended, conceptual piece that explores how we represent ourselves individually and collectively, asking participants to consider their identity in social media and in public. It asks all viewers to contemplate portraits of people from different ethnicities, and gender identities. The imposing scale and prominent placement of the sculpture examines the power dynamic of public monuments, placing everyone who interacts into a role of recognition. “As We Are” addresses the relationship between self and representation of self, asking the subject of the portrait to reconsider presence through magnification. It is intended to provide amusement and evoke larger discussions around the phenomena of social media, diversity, and the power dynamic of public art. The sculpture is an automated mechanism that does not reproduce the subject but rather creates a stylized representation that heightens the complex relationship between digital semblance and presence. Participants may experience a slightly disconcerted feeling that the portrait displayed is simultaneously theirs and not theirs. Moreover, they may sense that the portrait displayed of another person is not an accurate or full representation of that individual. This rift references the nature of photography as a limited representation of a being or moment. 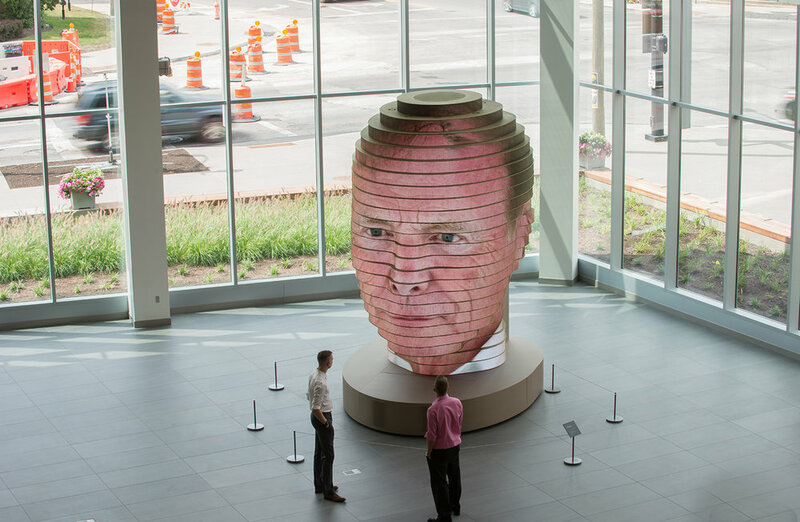 To further this concept, the eyes and length of nose of each subject are manipulated slightly to conform to the sculpture, speaking to the use of photographic manipulation software in the hands of the general public. Whether aspiring to an ideal or toying with identity, the democratic means to change appearance brings into play the fluid nature of identity. The magnification is self-initiated and comes from within the piece; every person displayed will have been a participant. The interaction of many yields a whole greater than the sum of its parts in the transition between portraits; identity is progressively merged to a rough hybrid for a moment before the next portrait is fully displayed. Combined with the formalistic approach, this visual hybrid asks the viewer to consider a bridge between cultures, gender, and lifestyle. This piece resides in a public place accessible by all and is designed to achieve an imposing stature similar to traditional public monuments. It utilizes a power dynamic usually reserved for notable, heroic, governing figures and instead allows every participant to experience a modern representation of acknowledgment. Through the collective elevation and recontextualization of all who participate, ‘As We Are’ focuses on the now commonplace act of documenting one’s existence in an effort to connect with others. It considers how self-representation has evolved by confronting the idea of self, and recognition of what we seek in and from other people.